HD, Blu-ray, 3D – it’s all a conspiracy! A salesman accosted me at an exhibition once and manoeuvred me over to his stand where there were two identical TVs side by side. He was blathering on about the difference that High Definition (or HD) makes to the viewing experience. I looked carefully at the two screens which were showing the exactly the same program. When the salesman finished his pitch, I asked him when he was going to switch on the HD. He looked at me as if I was a mooncalf and told me it was already on. Puzzled, I asked him which screen was HD. By this time, the salesman thought I was making fun of him. If there was a difference in the fidelity of the display, it was far too subtle for me to pick up. When our TV needed replacement, we bought an HD model, but only because every TV on display was HD by that time. 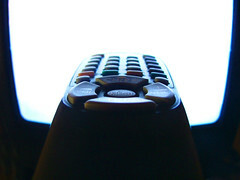 However, in order to view HD on our TV, we would either need to replace the satellite box or the DVD player and we can see no compelling reason to do so. The satellite box would cost us more money for the same but slightly prettier content. If we replaced the DVD player with a Blu-ray player, there would be no difference unless we also replaced our DVDs. If I was a cynical man, I would say that such advances come along every now and then and are manufactured to keep the consumer electronics industry and the film industry ticking over. For the consumer electronics industry, they get to sell yet another TV set and another media player. For the film industry, they get to sell the exact same content all over again and usually at inflated prices. There’s many a good tune played on an old fiddle and not only were some of my favourite films shot in standard definition, they are in black and white to boot. They are compelling viewing because of the acting and the storyline, not because of the technical flash-bang wizardry. Don’t get me wrong, I love the impressive special effects that are possible these days with CGI, but in far too many recent films, there is very little else on offer. If you are one of the people who likes to keep up with the entertainment revolution, take a good long look at your shelf full of blu-ray discs. You are going to have to pay for the privilege of downloading them all over again in 4D holographic projection format (or whatever the next giant leap in home entertainment happens to be). During my childhood, before we undertook any long journey, my dad used to spend the evening beforehand doing his homework. He would sit at the dining room table with his trusty road atlas open in front of him. Working methodically, he would trace a route from where we were to where we ultimately wanted to be, noting down any major place names on the way. During the journey, we would look out for direction signs to place names from Dad’s list. A medieval traveller would probably recognise the idea. If you want to get from Falmouth to London, you follow the milestones for Truro and then for Bodmin and so on. The system worked well, mainly because Britain has some of the clearest and best road signage in the world. 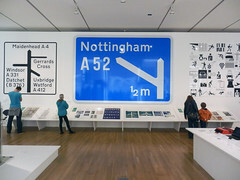 Thanks to the efforts of Jock Kinnear and Margaret Calvert, the original designers of our modern road signs, roads are easy to identify and it is very easy to pick out direction signs for major towns. With the advent of a piece of software called Autoroute, we were able to automate the route finding process. After firing up the software and choosing the start and finish points, the system would churn away for a moment before offering the fastest route between the two. If you were lucky enough to own a printer, you could print out a map and step by step directions to take with you. Eventually web sites became available offering route finding which negated the need to install any software. Of course such levels of prior preparation are not strictly necessary. Armed with a trusty navigator and a road atlas, you could navigate on the go. It’s definitely better if I navigate and my wife drives rather than the other way around. During one trip where the roles were reversed, we were driving down a road beside a river heading for a town on the coast. I had this nagging feeling that we were on the wrong side of the river and every time we neared a bridge or a ferry, I asked my wife to confirm which side we were on. Each time, she insisted we were on the correct side and it was only when we physically ran out of road that she accepted that we were indeed on the wrong side. When the US military opened up their network of Navstar satellites to public use, portable devices became available which could automatically pinpoint their location anywhere on Earth. As long as a satnav box can find enough satellites, because of the doppler effect, there will be a delay in communications with each one allowing the triangulation calculation to be made. Smartphones now equip us with a phenomenal array of navigational tools. We can find out where we are, which direction we are facing and how to get to where we want to be. There are virtual reality apps which overlay labels on our screens to show exactly where nearby points of interest are. We can search for a nearby station or restaurant. We can even do all this using our voices alone. Early explorers who navigated huge distances purely by the position of the Sun would probably find it highly amusing that we still get lost even with all these tools to help us.